Fri I went to help my mom at her wards fabulous friday. She was helping the women in the ward make these cookers! They look like mini me bean bags but you actually can cook in them. They are really cool she has cooked carrots, potatoes, and chicken so far! You only have to get them boiling for like 2 mins and then you leave it in their for an hour or more, depending on what it is, and it is perfect. This is an emergency thing! I am so making some so if I ever needed to I would kind of have a stove in a way! This last Saturday my mom and I took my nephew and niece to Wheeler Farm to make a scarecrow, pick a pumpkin, play games and see all the animals. It was so much fun! Here are a few pics from the day. I love these two so much and my mom! They are so much fun and the cutest kids ever! 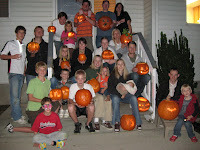 Then Sunday we had our Annual Pumpkin Carving Contest with our extended family! One of our greatest traditions! I will also include some pics of this as well. Hope everyone has a fabulous Halloween and hope to see everyones costumes posted if you havent already! P.S. To those of you that have tagged me I will get to it eventually I promise! I will be out of town til Fri and then I will get on it. How fun! Your niece and nephew are so cute! I love this holiday...maybe more than Christmas. Ok, maybe not that much, but it is up there! Love your hair!! !